Chinese IDN registry opens office in “China’s Silicon Valley”. 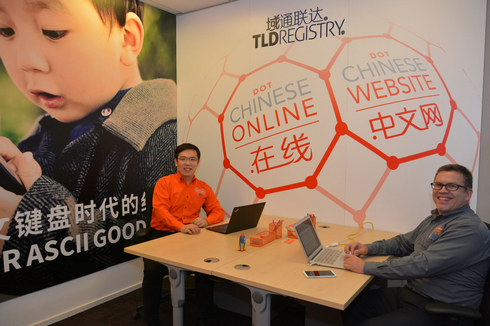 TLD Registry, the company behind the Chinese IDNs Dot Chinese Online (.在线) and Dot Chinese Website (.中文网), has opened a Chinese headquarters and named a new General Manager for China. The company’s China headquarters is in Beijing’s Zhongguancun, commonly known as “China’s Silicon Valley”. Last Friday’s opening party was attended by Embassy of Finland‘s Minister Commercial, the Service Delivery Center of the State Council Office for Public Sector Reform‘s Counsellor Mr Yu Yang, and the China Network Information Center‘s Deputy Director for Registrar Administration and International Business. TLD Registry also announced that it has hired Jin Wang to be its China General Manager. Wang was previously Business Operations Officer for the China Internet Network Information Center (CNNIC), which manages the .cn domain name registry. The company’s two IDN top level domain names have over 50,000 registrations, including many by the Chinese government. Pictured: China GM Jin Wang (left) and CEO Arto Isokoski.